The Goldarc 8 has legendary elasticity and a high amount of grip. This rubber employs its sturdy pimple geometry to maximise its elasticity. The pimples used are very large to increase the power produced from the mid-distance. The rubber gets excellent feedback and a clear sound upon contact with the ball, providing the player with much confidence in his shots. The Goldarc 8 is suitable for both the forehand and backhand of a blade. 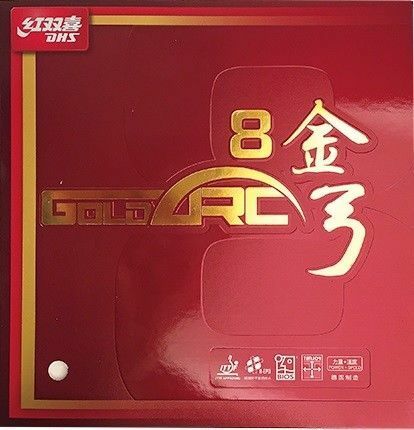 The Goldarc 8 was worked on by the DHS development center, German rubber experts, and multiple-time world champions, wang Liqin, and Ma Long, to create the perfect highly elastic, non-tacky rubber. This rubber is the medium hard version (50.0 deg).